Originally from France, Nicolas Doucet lived most of his adult life in UK where he worked through various game publishers (EIDOS, EA, LEGO) before entering Sony as a Producer. In 2011, he joined Japan Studio to create 'Team ASOBI' and contribute towards the launch of PS4 and PS VR with 'The Playroom' and 'The Playroom VR'. 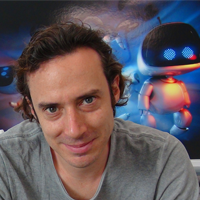 In 2018, Doucet and his team released critically acclaimed title 'ASTRO BOT Rescue Mission' for PSVR.